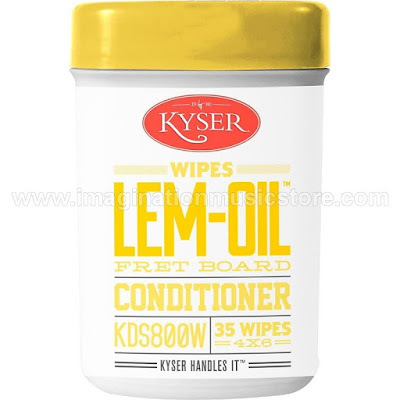 Kyser Lem-Oil might just be the best kept secret for luthiers worldwide. Keeping your fret board from drying out prolongs the life of your instrument, and keeps it looking shiny and new. A smoother fret board makes for faster, easier playing. The next time you change your strings, treat your fingerboard to a cleaning with Kyser Lem-Oil. Available as 4oz spray bottle or portable canister of 35 wipes.